The Customer Quote Request feature goes hand-in-hand with the Billing Review Access, and can possibly be used to encourage more business from your current customers. 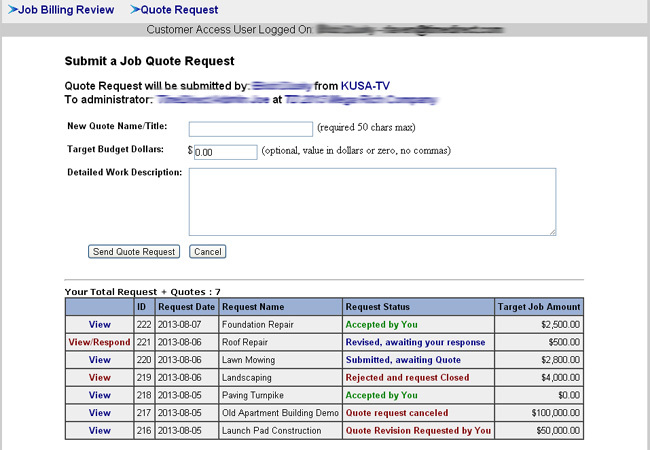 When you set up Billing Review Access, you can also grant Quote Request ability to any login account. Either as a stand alone feature, or one used in conjunction with Billing Review, the customer will be able to describe additional work needed, and request a quote dollar amount from you. Through the system, the quote requests and the quotes can be revised until both parties are satisfied, or the request is canceled. This is a perfect way to make a customer think of you first when new or additional job work is required!